Fracking, coming to north Georgia soon. DALTON, Ga. — Trillions of cubic feet of natural gas believed to lie below the hills of northwest Georgia have remained virtually untouched and unwanted — until now. In Alabama, the Conasauga shale field contains 625 trillion cubic feet of gas, according to Bill Thomas, a geologist who taught at the University of Kentucky and Georgia State. A similar amount could be underground in Northwest Georgia, he added. Wish I didn't have to say I told you so: Fracking: coming soon to a state near you? 26 Dec 2012. No fracking. No nuclear. No biomass. Let's get on with solar and wind. Tomorrow is the second anniversary of the earthquake and tsunami that heavily damaged four of the six nuclear reactors at Fukushima Dai-ichi in Japan on 11 March 2011, also known as 3/11. The broken reactors at Fukushima continue to leak radioactive substances into groundwater, the sea, and the air, where it is carried across oceans to the U.S. and elsewhere. And it could still get much worse: if the No. 4 reactor pool, still suspended in the air, collapses and causes the disintegration of spent fuel rods from all the other reactors there, Tokyo, 200 miles away, will have to be evacuated. Fukushima's GE reactors are the same GE Mark I design as Southern Company's Plant Hatch 1 and 2 only 100 miles from here at Baxley, GA, and about 200 miles from Atlanta and Charleston. Hatch is leaking radioactive tritium into our groundwater again. Five more reactors within 500 miles of here are also GE Mark I. On 3/11, we will mark Fukushima day by using as little utility supplied electricity as possible. This direct Action is designed to punish the utility companies for continuing to push for nuclear power even after the Fukushima disaster has proven that it is just too dangerous. On that day, we will punish them in the only way that they understand, by denying them our money. There will be four levels of participation, go to the website, www.unplugnuclearpower.com for a more complete description. Also, be sure to join the Event. Finally, if you are in a group our organization that can endorse this Action, please let us know. The VDT had a small front page headline yesterday: "Floridians warned about river contamination". That story was also heard in Florida, in Madison, Gainesville, and elsewhere, emphasizing something that Valdosta didn't mention: people live downstream of Valdosta's wastewater spill, all the way down the Withlacoochee and the Suwannee Rivers to the Gulf of Mexico. The story also made the AJC. Green Publishing, Inc, which covers Madison, Lee, and Greenville, Florida, reported yesterday, ALERT: FLORIDA DEPARTMENT OF HEALTH WARNS OF POSSIBLE WASTEWATER CONTAMINATION: GA wastewater plan overflow may impact Withlacoochee and Suwannee Rivers. TALLAHASSEE- The Florida Department of Health (DOH) today issued a caution to residents in the counties surrounding the Withlacoochee and Suwannee rivers. 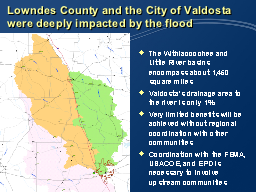 The Withlacoochee Water Pollution Control Plant in Valdosta, GA has overflowed into the Withlacoochee River, which flows south, connecting with the Suwannee River. China has surged ahead of the US to regain its title as the world's biggest investor in renewable energy, new figures showed on Monday. The article continues by trying to downplay solar and wind because of a drop in investment from other countries, while not mentioning that solar and wind deployments continue to climb. According to Todd Woddy in Forbes 22 January 2013, Chinese Solar Market Boomed In Q4, Accounting For Third Of Global Demand. China has incentive and is doing something about it, as Feifei Shen and Reed Landberg wrote for Bloomberg News 30 January 2013, China to Boost Solar Power Goal 67% as Smog Envelops Beijing.